January 8,2016- German "Kuya Germs" Moreno has passed early today at the age of 72. A lot of the veteran host's supporters and friends grieved after John Nite announced his uncle's death. Nite said that Kuya Germs passed at 3:20 am in St. Luke's Medical Center in Quezon City because of cardiac arrest. 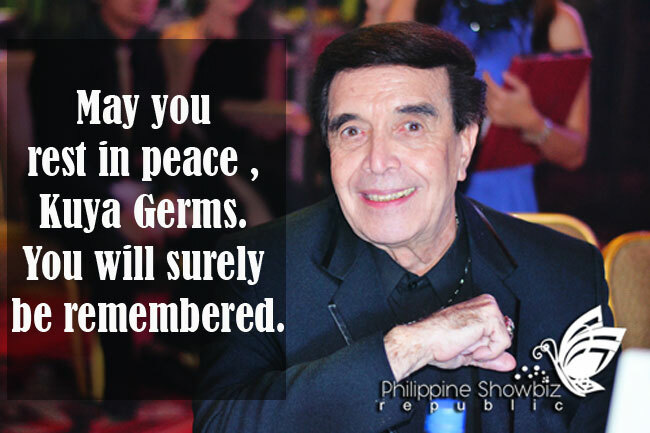 While on his sickbed, Kuya Germs was surrounded with his family and friends who never left his side. Kuya Germs suffered from mild stroke on January 2nd and was rushed in the same hospital. Although Moreno had been on comatose for awhile, he recovered fast enough and got better, reason for everyone to be surprised by his sudden death. Inspite of their loss, Nite mentioned to GMA News that they were still mourning because of his uncle's passing but were comforted just to think that Kuya Germ's legacy as a talent builder and a respected host still lives on. They were proud as of how Kuya Germ's had affected and influenced the stars of Philippine Showbiz in one way or another. German Moreno is considered to be one of the pillars of Philippine Entertainment. He hosted variety of shows like That's Entertainment in 1980's and Walang Tulugan with the Master Showman. Aside from hosting, Moreno also managed some artists like Jhake Vargas. Moreno also started the Walk of Fame in Eastwood. On the other hand, confusions about Kuya Germs' death even before it really happened spread like a wildfire online because of misinformation. Gina Alajar and Bb Gandanghari shared their frustrations on their Twitter accounts because of the incorrect news. We, the CEnterTechNews team, expressed pir sincere condolences to the Moreno Family. May you rest in peace , Kuya Germs. You will surely be remembered.